So, I’m watching this news story on “Frontline” about the NCAA college basketball organization and how much money they make off of the basketball players, but pay them noting in return. I’m not a big sports fan at all, so everything they mentioned in this broadcast was completely new to me. After watching it, I was in total shock at how screwed up this organization is, and amazed at how corrupt the people that run it are. Here’s a few key points they discussed in the broadcast. The NCAA alone rakes in BILLIONS each year by selling the broadcast rights of their games to television networks, plus signing huge commercial endorsement deals, plus ticket sells plus licensing their brand and the players names to sell merchandise, and god knows what else. This all adds up to BILLIONS! Yes, you heard me right, BILLIONS (believe it or not, that isn’t a typo). The coaches get huge salaries (most receive upwards of 2 million a year). The people on the board get huge salaries… and that goes for almost everyone that holds a high position in the organization. All of this money is being generated because of the players… and they get paid ABSOLUTELY NOTHING. Appalling isn’t it? 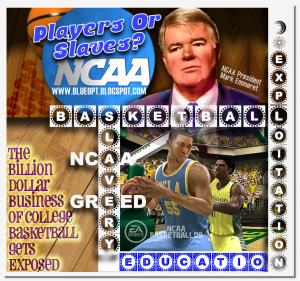 The NCAA treats their players like slaves or indentured servants. I couldn’t believe the level of exploitation that goes on in college basketball. A crass but fitting analogy would have Mark Emmeret (the president of the NCAA) playing the role of a pimp, and the NCAA college basketball players in the role of his prostitutes… Actually, Mr Emmeret treats the players worse than prostitutes because pimps would at least let their hoes keep some of the money they make. The players give these teams their all and work very hard to play each game to the best of their ability. A future in the NBA isn’t promised to these guys. They could easily get injured in a game, and their career as a pro athlete would be over before it even began. I also learned from watching this that the players are required to sign a ridiculous contract that gives the NCAA the right to use their names and images in perpetuity for whatever purpose they choose, and keep 100% of any revenue that it generates. For example, they created a video game with EA Sports that used players as characters in the game. Some of the players they used had already made it in the NBA, and some of them weren’t lucky enough to transition into professional sports after college. But because of the contract they signed in college, the NCAA didn’t have to share any profits with any of the players at all. That’s just the tip of the iceberg with these guys. There was another situation described in the news report that caught my attention. It’s arguably the most appalling part of it all. The NCAA does not offer free tickets to the families of the players. These tickets can be quite expensive… so if a player comes from a low-income household, the only way their parents can watch them play is on tv. How despicable is that? The investigative reporter exposed a number of situations that were extremely exploitative and designed to put huge sums of cash into everyone’s pockets, except the players. After watching the program in its entirety, I began to think about how long this has been common practice in the NCAA. This has been going on for decades, so why haven’t I seen this discussed on the news before. Why haven’t I read about this in the paper anywhere, or seen it questioned in any magazines? Why is “Frontline” the first news show to do a complete in-depth investigation into this? Then the answer hit me, and it made perfect sense. Frontline is a PBS news show. It’s not owned by any corporation. They do not generate revenue to pay for operating costs by selling commercial time slots to advertisers. Because of this, they aren’t beholden to any corporate pressure, or higher-ups with hidden self-serving agendas, like ALL of the other tv networks and news programs. College basketball brings in a ton of money to whatever tv network they choose to license the broadcast rights to. This gives the NCAA the power to kill any story that shows them in a negative light. It’s stories like this one that shows us the importance of a network like PBS (LONG LIVE FREEDOM OF THE PRESS). It’s time for the NCAA to set aside their greed, and get rid of their policies that exploit and use their athletes. Here’s an update: Apparently the NCAA President Mark Emmeret, who was interviewed in the story, saw how awful and greedy him and his organization looked on the broadcast, so he released a statement saying that he has changed his position on not paying student athletes. He didn’t give any specific information on what policies he’s actively seeking to change, but he said that the idea of compensating student-athletes should be considered. Vague, I know, but it’s a start headed in the right direction. (http://to.pbs.org/gpJ2a7 link to the short clip displayed above).